Piemontese decks have been enjoying their moment in the sun since late 2014, with both Osvaldo Menegazzi and Giordano Berti creating limited-edition facsimiles of historically important Piemontese decks. Camelia Elias illustrated her book, Marseille Tarot, with a Piedmont deck by Carolus Zoya in a private collection that’s never been seen by the public. (links to reviews at bottom.) I’ve been on a quest to understand the Piemontese style: when it started, how it differs from the Tarot de Marseilles, and its geographic distribution. Piemontese decks are a Tarot de Marseille with some interesting design tweaks, like the Fool’s butterfly, the human figure with a red tail on the Wheel of Fortune, and the face in the Devil’s stomach. Contemporary Piemontese decks are double-headed, and are one of few 78-card decks still being produced for games. The first Piemontese deck we know of was printed by Giuseppe Lando of Turin (Torino) in 1760 (see it in Kaplan’s Encyclopedia Volume I, p. 150). The first double-headed deck was printed in 1862 in Turin; and by 1870, all Piedmont decks were the double-headed style in use today. This contemporary style was preceded by over 100 years of a single-headed style. Both the Strambo deck reproduced by Il Meneghello, and Berti’s Vergnano deck are from this era. Piedmont is in the extreme northwest corner of Italy, surrounded on three sides by the Alps, and by Lombardy on the east. Beyond the Alps are Switzerland and the region of France that was once the independent Duchy of Savoy. Piedmont and Savoy were one political unit until 1860. The Duchy’s capital was Chambery, near Lyons, a major card making center that exported playing cards to Piedmont. The first card maker documented in Piedmont is Francesco Franco who worked in Turin from 1627 to1629. Over half the Piemontese printers listed in Kaplan’s Encyclopedia were located in Turin, the capital of Piedmont; but a playing card industry also flourished in the towns along the Sesia River in eastern Piedmont. The first deck printed in the Sesia Valley that’s still in existence was made by Giuseppe Ottone of Serravalle in 1736. The deck is now in the Fournier museum and appears to be a standard TdM. Tarot has deep roots in Piedmont, with evidence of a vigorous tradition in each century of tarot’s history. The Duchy of Savoy was created in 1416 when the Holy Roman Emperor elevated Count Amadeus VIII to Duke, making him ruler of Savoy and Piedmont. In 1427, Filippo Maria Visconti, Duke of Milan, married a daughter of Amadeus in exchange for giving him the town of Vercelli, where Piedmont-style decks were printed 400 years later. This marriage is believed to be depicted on the Lover’s card of the hand-painted Carey-Yale deck commissioned by Filippo. About this same time, Filippo commissioned a deck of hand-painted, illustrated cards from his secretary Marziano da Tortona. Through the exchange of gifts and visits between Milan and Savoy, it’s possible that tarot reached Chambery and Lyons at an early date. Printed tarot books and licenses for card printers and vendors give evidence of an unbroken tarot tradition in Piedmont throughout the 16th and 17th centuries. By the mid-1700s, card makers in Piedmont were producing Tarot de Marseille decks with French titles; while other printers, especially in the Sesia River valley, were making Piemontese decks. Guidebooks and tourists’ letters and diaries mention the popularity of tarot games in the region. A rule book for the game was printed in Turin in 1787. After Napoleon conquered Savoy in 1802 and the center of political power shifted to Paris, the onerous taxes and restrictions on playing cards eased up. This gave printers more freedom to reproduce the regional style which came into its own after 1860, when Savoy was absorbed into France, and Piedmont became the capital of the recently united Italy. By the mid-18th century, a regional Piedmont style was emerging, while Piemontese printers were also churning out French-style TdMs, and printers in Lyons were exporting decks like the Dodal to Piedmont. Michael Dummett claimed that the Dodal deck exported to Piedmont from Lyons between 1701 and 1715 is the ancestor of the Piedmont style. He believed tarot had disappeared in Piedmont by the late 17th century, so any decks printed in the region had to be based on a French model. I disagree. There is documentation for tarot in the region as far back as 1570. I think it’s entirely plausible that there is an unbroken tradition of a regional tarot deck spanning six centuries. Dodal and Piemontese trump cards share only two unique design features: the face in the Devil’s belly, and the Pope’s staff with a flag and ball rather than the triple cross. 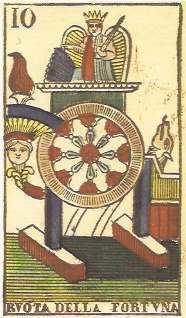 Many unique features of the Dodal deck don’t appear in Piemontese decks: blindfolded Cupid, the scalloped canopy on the chariot, the woman on the World card wearing a belt of leaves instead of a scarf. The Dodal deck does not account for most of the design variations in Piemontese decks. Zoya’s deck does share many features with Dodal, but we do not know his dates, or when he arrived in Piedmont, so his influences are a mystery. Click here for a list of the unique features in Piemontese trumps. 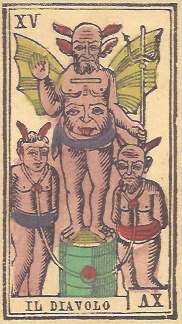 I believe the unique features of Piemontese decks such as the Hermit as a monk, the lion fending off the woman on the Strength card, the butterfly in front of the Fool, and the unique Devil, are a local tradition that was never lost. We don’t have evidence of it before 1760 because there are so few cards extant from earlier centuries. But I don’t see any compelling evidence that these design features were imported from France. The Piemontese style deserves to be better known, as it represents a regional folk tarot tradition that may extend back to the 16th century. Along with the Milanese/Lombardy pattern, it has the longest unbroken history of any tarot style. The game of tarot never died out in Piedmont and Lombardy, and still flourishes in these regions today. Caldwell, Ross Sinclair, Thierry Depaulis, Marco Ponzi, editors and translators. Explaining the Tarot: Two Italian Renaissance Essays on the Meaning of the Tarot Pack. Maproom, 2010. DePaulis, Thierry. “Il Tarocco Piemontese,” in Il Castello dei Tarocchi, ed. Andrea Vitali. Lo Scarabeo, 2010. Dummett, Michael. The Game of Tarot. Duckworth, 1980, pp 196-198, 258-260. Elias, Camelia. Marseille Tarot: Towards the Art of Reading. EyeCorner Press, 2015. Kaplan, Stuart. The Encyclopedia of Tarot, Volumes I & II. U.S. Games Systems, Inc., 1978 and 1986.
Review of Camelia Elias’ book illustrated with Carolus Zoya’s deck.